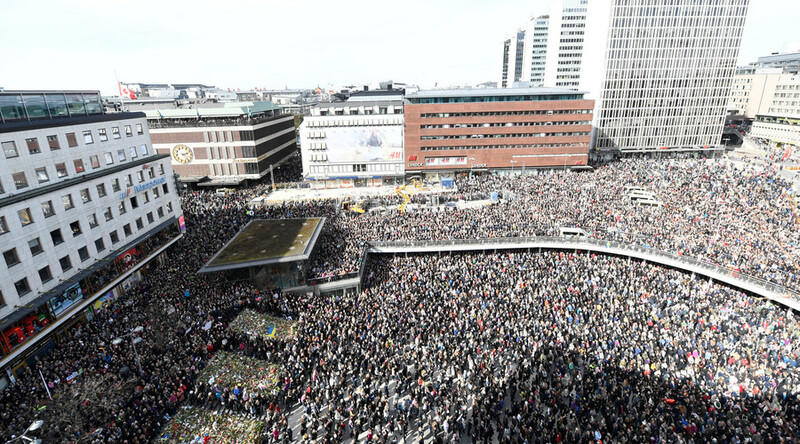 Thousands of people have turned out in Stockholm city centre Sunday for a vigil to commemorate the victims of Friday’s truck rampage which killed four people and injured at least 15 others. Swedes trying to come to terms with the attack organized the event on Facebook, encouraging people to turn out in Sergels Torg plaza, the city's main square, near the site where the truck crashed to a halt in a department store. The Kärleks manifestation, which roughly translates as “Love Fest” saw masses of people gathering from the early morning, laying wreaths in the square to commemorate the victims. A number of hashtags have been created in the aftermath of the attack, including #KärleksManifestation, #SergelsTorg and #LoveFest in a show of solidarity.